In late 2010 I had the good fortune to visit the Uffizi, and spent much time staring at the famous self-portrait of Raphael. Little did I know at the time that this painting was to become the spark for a new direction in my learning about art history, and its increasing interface with the sciences. Despite resistance from some quarters, scientific data is increasingly described in critical catalogues and journal articles. The most recent Raphael catalogue, Jürg Meyer zur Capellen's three volume opus on Raphael's paintings alone (a fourth is planned on frescoes) pays much attention to these reports, in describing the condition of the works and informing comments on technique. Meyer zur Capellen incorporates this manner of presentation with the traditional discussion of provenance and stylistic factors contributing to an overall statement (or speculation) on attribution and date of creation. As much as Meyer zur Capellen's work has been invaluable as a resource for my own Raphael project, it has also demonstrated some interesting points. Is it necessary for the author to state their intuited response on what they feel is an authentic Raphael? Is it not sufficient to simply present the facts, particularly when they are often incomplete and inconclusive? When examining the same object, if multiple observers arrive at different conclusions, the accuracy of those observers must be questioned. That some experts are more qualified to make these observations is obvious, but when an increasing number of experts still have divergent opinions - it can be difficult to accurately describe the known facts in the case. 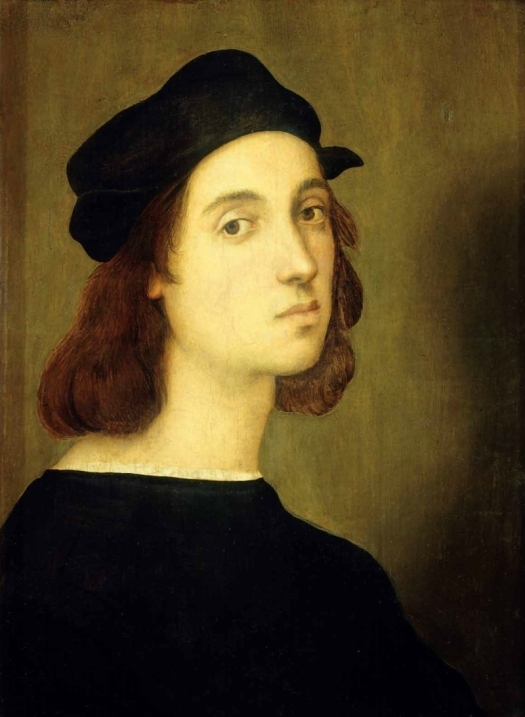 To illustrate this - I present as a case study this most well known of Raphael self-portraits. The variation in critical opinion on this piece is quite staggering. In fact, if your selection of (expensive) Raphael texts was sufficiently selective, you would arrive at quite different responses to this work in each instance - ranging from a belief that it is an autograph work, to an outright dismissal as a copy or follower piece. c.1505 (Meyer zur Capellen 2001). The early ownership history of this work is itself a matter of debate. The literature varies in its acceptance of the mention of a Raphael self-portrait in the inheritance of Vittoria della Rovere. Shearman for example, infers this description is of the Hampton Court portrait, presently regarded as a follower piece. The Uffizi inventory lists the acquisition by Leopoldo de' Medici as the first documented ownership, although De Vecchi proposes an additional possessor of the work before this point. ?1588 De Vecchi (1987) speculates on an Urbino origin, and lists the panel was presented to the Academy of Saint Luke in Rome (the painters' guild) by Federico Zuccari in this year, subsequently passing to Cardinal Leopoldo de' Medici. The documentary source for his information was not provided in the catalogue volume containing this entry. Noted as part of the inheritance of Grand Duchess Vittoria della Rovere. This document - the Nota dei quadri buoni (record of fine pictures) listed the artworks of the Duchy of Urbino in advance of Vittoria's marriage to Ferdinando II de' Medici, finalised in 1634. This record describes "un rittratto di Raffaello di sua mano" (a portrait of Raphael in his own hand). It is not conclusively known whether this inventory description refers to the work in the Uffizi, as no other identifying features, inventory numbers or measurements are cited. 1663-75 Noted in the private collection of Leopoldo de' Medici. In 1667 Leopoldo was named Cardinal by Pope Clement IX, travelling to Rome. Much of the Cardinal's vast collection was incorporated into collections in Florence, including the Uffizi. The Uffizi digital inventory notes a 1675 date for the work still being in the Cardinal's private collection - likely an inventory made after his death in this year. The only consensus between scholars regarding this portrait is that it depicts Raphael. This assumption is related to Vasari's identification of Raphael as one of the figures in School of Athens, first established in the 1568 edition of his Lives. Beside a figure with its back turned and holding a globe of the heavens in its hand, is the portrait of Zoroaster; and next to him is Raffaello, the master of the work, who made his own portrait by means of a mirror, in a youthful head with an air of great modesty, filled with a pleasing and excellent grace, and wearing a black cap. Reported to be poplar. Whether this was determined via microscopy, visual inspection or other means is not clarified in available sources. Dating evidence for the panel is also not reported. They [the infrared photographs] reveal a very different kind of underdrawing from any seen so far, a surprisingly careful and patient rendering that hardly differs from a finished drawing. It was most certainly not made from a cartoon...It is modelled and shaded in a manner that shows considerable skill, and conceivably was necessitated by the nature of the self-portrait itself. But in the corpus of Raphael's underdrawings, it stands completely alone. Nevertheless, one of the most convincing proofs that the picture is Raphael's self-portrait is the remarkable nervous quality of the liquid underdrawing that has emerged in the infrared photographs, since it has the exploratory nature found in the artists independent drawings. 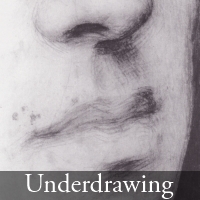 Meyer zur Capellen also supports Henry's opinion, stating "the particular handling of the line work is entirely consonant with Raphael's style" and offers the underdrawing and remodelling seen in the NGA Washington's Small Cowper Madonna as a point of comparison. Painted surface is described as "very thin" (Meyer zur Capellen) and "much abraded" (Henry). It is widely accepted that the portrait is in an unfinished state as the white of the sitter's shirt is the gesso underlayer left bare. Numerous restorations have been cited, with the most recent being in 1983-4. Much of debate about authorship has focused on the condition of the picture, although the 1983-4 restoration and infrared photographs have clarified details which were not available to earlier examiners of this piece. From an institutional perspective, the Uffizi has always listed this work with the same description as it arrived to the Medici collection - as a self-portrait by Raphael in his own hand. Of the more recent catalogues, Oberhuber and Meyer zur Capellen accept it as an autograph work, whereas De Vecchi, whilst initially ambivalent, categorically dismisses it in a 1995 publication. 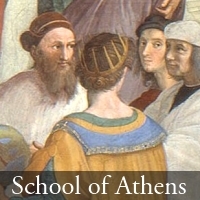 Oberhuber adds the clarification that Raphael may have returned to this piece after School of Athens, and assigns it a c.1509 date. This supposition is made on the basis of its similarity to the fresco self-portrait. Fischel assigns only parts of the execution to Raphael, particularly flesh tones. 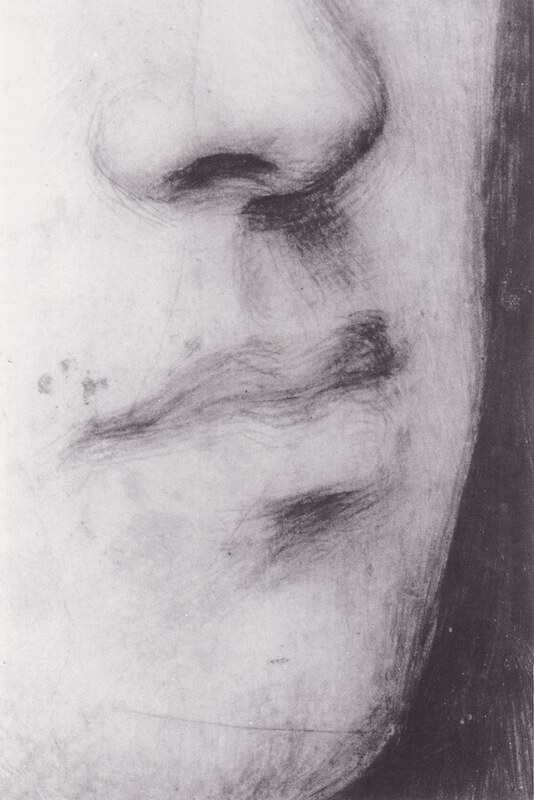 Wagner proposed that it was a copy after a lost original, although he would not have seen the infrared images of the advanced underdrawing, which suggests it is an original work and not a copy. Despite the reservations expressed by some scholars, it has remained a highly popular piece, attracting numerous copies in a variety of media particularly in the 18th and 19th centuries. The patchy nature of the literature concerning this famous piece is unfortunately not an anomaly in art historical research. A closer examination of the history of a piece will often reveal more disagreement than consensus among observers. Fortunately, to lift the state of catalogue reporting out of this fog, there is the "neutral review" standard. It is ultimately more useful to provide a complete account of the critical history of the work, without feeling the need to add to it unless more conclusive new evidence is available. This pragmatic approach is employed to great effect at the Cranach Digital Archive (cda), and forms the core of my own efforts in describing the history of works attributed to Raphael. Potentially more useful in future consideration of this picture would be an updated technical examination of the pigments and medium, with possible dating of the wood panel to rule out the possibility of it being a later copy. Fischel, O. Raphael. (Rackham, B. Trans.). 1948. Vol.1. p.60. Meyer zur Capellen, J. (Trans. Polter, S). Raphael. The Paintings. Vol.1. Arcos Verlag. Berlin. 2001. pp. 286-90. Oberhuber, K. Raphael. The Paintings. Prestel. Cat. No. 87. p.251. Thanks for a very nice summary. It's obvious that when scholars disagree, most must be wrong. However, even when they all agree, they can all be wrong. Your suggestion at the end of avenues for further research makes sense. Cheers Frank. I think it's worth pointing out that "right and wrong" is less important than a correct methodology that can admit "we dont know". There is a misconception that the sciences are obsessed with boiling things down to a "black and white" or a finite answer. This is OK when the data allows this, but a "scientific" methodology only allows us to describe things in more detail, and admit when there are deficiencies in the data that prevent a conclusion from being made. There are only subtle expressions of this in the literature. I was particularly fond of De Vecchi's 1987 entry that lists the piece as "traditionally attributed to Raphael" and that its condition "made attribution difficult." It was heartening to read Tom Henry arrive at a similar conclusion, though his statement on the underdrawing is far more difficult to navigate in a pedagogical sense.